Left is the cover of Issue 19 (1984), the first issue edited by David, covering the death of Edward Sokoine in a car crash. To the right is the familiar green cover David introduced a year later which many readers will remember. 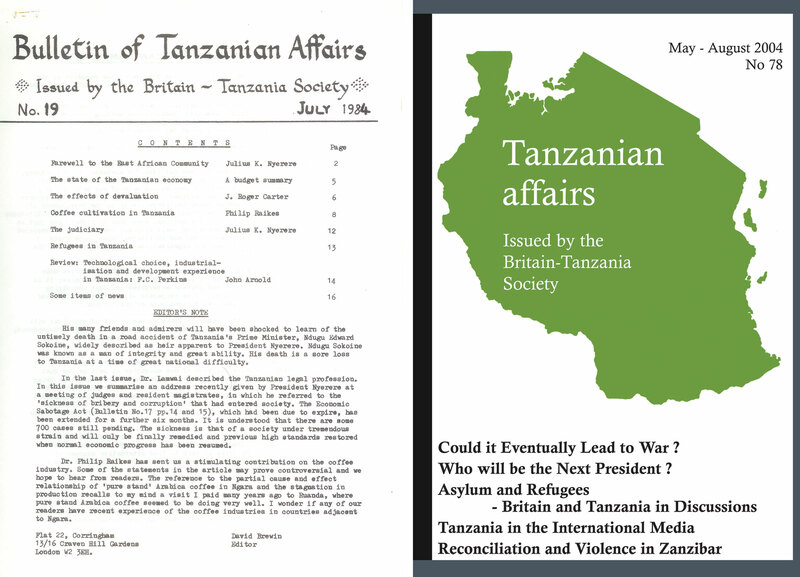 As the incoming editor of Tanzanian Affairs, I feel very lucky – and a little daunted – to be able to follow in the footsteps of David Brewin, who has done a fantastic job editing the journal for more than 30 years. 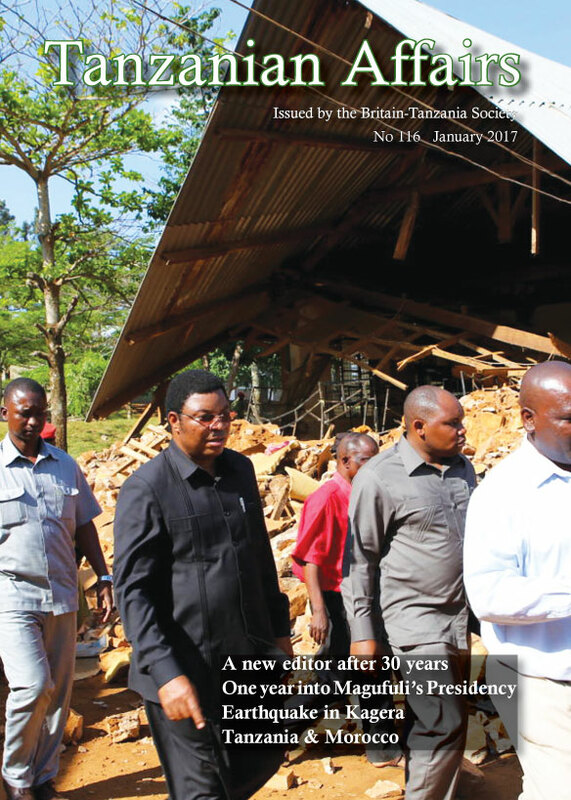 Over that time, Tanzanian Affairs has evolved and grown under his stewardship into the engaging, informative and highly respected publication that it is today. I am sure you will all join me in thanking him for his remarkable work. David has now decided it is time to step back from the editorship, though I am delighted to say that he will continue to be involved as a contributor. I promise to do my best to protect David’s wonderful legacy and to maintain the high regard in which TA is held by its readers. Since coming to office, the pace of President Magufuli’s activity has surprised many observers. In government, the phrase – HapaKaziTu! (Work and nothing else!) – rapidly evolved from a campaign slogan into a philosophy for governance. Whether it comes to economic policy and taxation, public services and public administration, corruption or the media, business as usual is no more. The president’s early actions against corruption, tax avoidance and waste drew praise and popularity from many quarters. With the Prime Minister, Kassim Majaliwa, he led concerted efforts to clamp down on corruption and raise revenues at Dar es Salaam port, and with the Minister of Education, Prof Joyce Ndalichako, to stop abuse of the higher education and student loans systems. Tight restrictions on foreign travel for public officials and on the use of hotels and conference centres for government meetings were introduced, and the President took a high-profile decision to replace expensive public celebrations of Independence Day in December 2015 with a national exercise to cleanup public spaces. Campaign promises to put an end to school fees and to reduce the basic rate of tax were acted upon. And over 300 public officials have been fired, suspended or reassigned, under the slogan of “tumbua majipu” – “piercing the boils”. Those who have been lost their positions include the heads of the Tanzania Investment Centre (TIC), Tanzania Communications Regulatory Authority (TCRA), the Prevention and Combatting of Corruption Bureau (PCCB), Tanzania Revenue Authority (TRA), Dar es Salaam City Council, and the Chief Secretary (the country’s most senior civil servant). (For further details, see previous issues of TA). This is coupled with a campaign to root out so-called “ghost workers” – civil servants on the government payroll but who do not in reality exist. Over 16,000 “ghost workers” have reportedly been removed from the payroll. “What would Magufuli do?” asked Twitter users around the world, celebrating the new president’s parsimonious approach to public spending, and comparing him very favourably with other heads of state. Forbes Africa magazine named him on their shortlist of five for Person of the Year (though he eventually lost out to South Africa’s Public Protector, Thuli Madonsela). More recently, the president has announced that the long-standing intention to shift the site of government from Dar es Salaam to Dodoma would now be fast-tracked. The initial decision was made by President Julius Nyerere in 1973, but had thus far translated into little beyond the relocation of parliament twenty years ago. President Magufuli announced the move would happen before the end of his first five-year term, and Prime Minister Majaliwa swiftly followed this up with a tighter timetable: that he would move by September, to be followed soon after by all other ministers. Further, he has purchased three new aircraft for the struggling national airline, Air Tanzania, and suspended the import of sugar and coal in an effort to support local producers. An opinion poll survey published by Twaweza in September 2016 found the president had the approval of 96% of Tanzanian citizens on the mainland, higher than any approval rating for any African head of state ever reported by Afrobarometer, an Africa-wide opinion polling initiative. The same survey found high levels of support for the president’s actions against corrupt public officials, against ghost workers, and for the removal of school fees. The president has positioned himself as being on the side of the ordinary citizen, taking on big business, corruption and waste, and his actions and slogans have captured the public imagination. At the same time, however, other aspects of President Magufuli’s style of leadership have increasingly drawn criticism – most particularly his attitudes to business, to the civil service, and to democracy. Investors in the tourist industry have complained that removal of VAT exemptions for many tourism-related goods and services will have a negative impact on their businesses and on the economy as a whole. Importers have argued that heavy-handed enforcement of tax regulations – including moves to charge import duties on goods in transit – will lead to a drop in revenues as transporters take their business away from Dar es Salaam to ports in Kenya, Mozambique or South Africa. Debates about whether or not tourist numbers, hotel bookings, port and transit volumes and tax revenues have declined continue to rage. 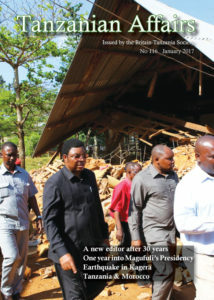 A disagreement over Tanzania’s largest cement factory – see also the economics and business section in this issue – is illustrative of these complaints. Ahmed Salim, an analyst at Teneo Intelligence, told Quartz, an online magazine, that the situation “paints an unfavourable and unpredictable outlook for investors looking at the Tanzanian market.” Coupled with a perception that businesses are being subjected to sudden changes in tax policy, investors are reportedly concerned. Other observers are concerned that the new HapaKaziTu! culture in the civil service has spilled over into a climate of fear. Coupled with tight controls on expenditure and increased scrutiny of their past and present actions – see also the education section in this issue – this has left many civil servants reportedly feeling untrusted and undervalued, and afraid to make decisions. The Shadow Minister for Public Service Management and Good Governance, Ruth Mollel, herself a former Permanent Secretary, warned the government that its disregard of the rule of law would backfire. “This country cannot be governed through personal opinions and decisions while there are laws set to be adhered to,” she said. 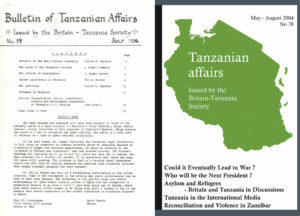 “We have been witnessing cases of civil servants being fired and demoted without being given the opportunity to be heard, and this has created fear and demoralised the majority of the workers.” Trade Unions, including the Tanzania Teachers Union and the Trade Union Congress of Tanzania (TUCTA), have also questioned the apparent lack of adherence to proper disciplinary procedures. Finally, a third set of complaints relate to democracy and human rights. In December, Maxence Melo, one of the founders and owners of Jamii Forums, a popular online discussion forum, was arrested. He was later charged with two counts of obstructing police investigations under the Cybercrimes Act – for refusing to reveal the names of whistle-blowers using the site – and one count of operating a website that does not use the “dot-tz” top level domain. This was the latest in a series of moves that leave the media, opposition politicians and human rights’ activists feeling vulnerable. A number of journalists and politicians have been arrested and/or charged with sedition. Live TV and radio broadcasts of proceedings in parliament – previously very popular – have been stopped. The Legal and Human Rights Centre (LHRC) has raised the question of whether public officials dismissed for wrongdoing were given a fair opportunity to defend themselves. Since the 2015 elections, several arrests have been made under the Cybercrime Act for insulting the president on social media. In June, the President announced a ban on political rallies, on the grounds that the elections were over and the government and the public needed to stay focussed on delivering development. The ban was later extended to cover indoor party meetings. Leaders of the opposition parties, Chadema and ACT-Wazalendo, denounced the move as unconstitutional, and Chadema planned a nationwide “day of defiance” on September 1st, under the banner Umoja wa Kipinga Udikteta Tanzania (UKUTA) – Alliance Against Dictatorship in Tanzania. The police announced that the protests did not have permission, and for a few days in late August the rhetoric on both sides grew increasingly aggressive. Tensions were raised further by the murder of four police officers in a probably unconnected incident in the outskirts of Dar es Salaam. “If anyone complains about human rights, send them to me,” said the Dar es Salaam Regional Commissioner, Paul Makonda, while directing the police to show no mercy in response. A confrontation was avoided when Chadema postponed the planned demonstrations. More recently, the enactment in November of the Media Services Act has attracted criticisms that the government is clamping down on freedom of the press. Among other controversial provisions, the bill introduces a requirement for all media to publish or broadcast news “as the government may direct,” along with a system of government-controlled accreditation for individual journalists. The opposition argued in parliament that this enables the government to screen journalists so that only those who report favourably are allowed to continue. President Magufuli has shaken up Tanzania in his first year in office. His supporters would argue that taking on such ingrained problems cannot be done without upsetting some people, and that his opponents are determined to oppose him whatever he does. His critics point to a growing list of concerns. President Magufuli is set to remain in office until at least 2020. Maintaining this level of activity for that length of time will not be easy. He has already shown, however, that he is up for a challenge. An earthquake measuring 5.7 on the Richter scale struck on September 10th in Kagera region, in the far north-west of the country. Reports vary on the precise extent of damage caused, but at least 19 people died as a result, and over 500 were injured, the majority in and around the town of Bukoba or in Missenyi District to the north. Over 2,000 buildings were destroyed and thousands more were damaged. Damage and deaths were also reported in neighbouring Uganda, though the effects of the quake there were smaller. “Thousands of people who have been left homeless after this earthquake are being sheltered in schools, while we try to mobilise tents to accommodate them,” he added. The government quickly established a response fund and encouraged public donations, with around TSh 5bn raised within four weeks. This includes contributions both from within and outside the country. Significant donations came were provided by the business and media tycoon, Reginald Mengi, (TSh 110m), the Chinese embassy in Dar es Salaam (TSh 100m), Mohamed Enterprises Limited (TSh 100m), Tanzania Breweries Limited (TSh 100m), and several oil marketing companies. There was criticism later in parliament that some aspects of the government’s response had been slow, with less than 20% of the funds raised having been spent by the end of October. 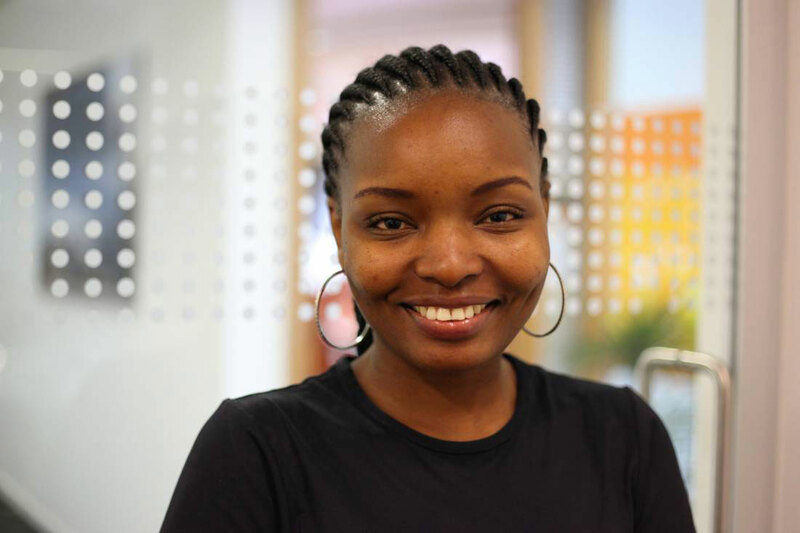 Rebeca Gyumi, the founder and executive director of Msichana Initiative, has won the UNICEF Social Change Award for her work fighting child marriages in the country, alongside two other winners. The Msichana Initiative won a landmark case in July this year after the High Court ruled that two sections of the Marriage Act were unconstitutional. Miss Gyumi said changing the law was one step towards ending child marriages in Tanzania, but called for a wider campaign to change inhuman acts against children. “I would like to dedicate this award to all girls in Tanzania and every girl around the world who escaped child marriage in search of freedom. You are my true motivation,” she said. A rare annular solar eclipse was witnessed in in Mbeya and Njombe regions on September 1st, attracting thousands of Tanzanians and international visitors. The event lasted for close to three hours, during which time the air went very cold, according to local reports. The eclipse was also visible elsewhere in the country – including as far away as Mwanza – though less dramatically. President Magufuli of Tanzania, often known locally as the ‘Bulldozer’, is vigorously continuing his campaign against corruption throughout Tanzania. The President is now turning to other areas of public service, in particular, the industrialisation of the economy. However, he is well aware of the overwhelming importance of agriculture to the economy. A recent measure he has introduced is the banning of public organisations holding meetings outside their offices so that public events such as the annual agricultural show are no longer an opportunity for ministries to award contracts including bribes for uniforms, catering and entertainment in elaborate pavilions. Dr Magufuli’s reforming zeal is evident in the revelation that a new policy on land tenure is being examined, which is likely to lead to a new national land policy, the draft of which is being subject to public scrutiny by the Ministry of Lands and Settlement Development. The main change is that conditions for foreigners trying to develop land for business would change. The normal period for a lease of land for development is 99 years, but in the purposed new policy this will be reduced to 33 years for foreigners. In justifying the change, it is said that there have been many instances where foreigner s have applied for land and not used it for the stated purpose. To curb such cases, foreign investors will have to register with the Tanzania Investment Centre (TIC) to acquire land. To purchase a parcel of land from individuals or companies, once the buyer and seller have agreed on the price, the seller is required to surrender the land title to the Commissioner of Lands in order to reissue it in the name of TIC. The intention is that the rights of Tanzanians will be protected and that land needed for development is being used for the purpose originally indicated. The aim of this is also to minimize conflict between foreign investors and communities, and to promote optimal utilisation of the country’s resources. Under the new draft land policy, foreigners will be allowed to directly own land (occupational rights), but not to hold it on behalf of others (derivative rights). Needless to say, the draft policy is facing criticism from many sides. Although the policy drafting process included consultations – conducted in 8 zones across the country – these have often been rushed and were not ‘conclusive’. For the first time in Tanzanian history a national land policy will recognise the right to equal access for land for both women and men. At present Tanzanian imports about 1,000 agricultural tractors a year. This has encouraged two Indian companies to establish a joint tractor plant in the Morogoro region. It aims to start with the assembly of fully-knocked-down tractors but will move on to the manufacture of complete tractors in the future. With Tanzania still producing much less sugar than is needed by the population, two cabinet ministers are planning to visit Mauritius, a major global supplier of sugar, on a mission to attract investors into Tanzania’s sugar cultivation sector. At the same time the government embarked in October, on a country-wide search for ‘hidden sugar’ often being hidden by suppliers in anticipation of increasing prices. Local firms are also already setting up new sugar firms mainly in the Morogoro, Kigoma and Songwe regions as well as in the costal district of Rufiji. The National Social Security Fund and a pension fund have also announced joint plans to establish sugar processing factories in Mkunazini, Ngerengere and Morogoro. Seaweed farmers in Zanzibar are complaining about the falling price of their product. They have appealed to the government to provide more harvesting equipment to help increase selling prices. The Japanese Aid Agency JICA recently convened a workshop to bring the seaweed farmers together. The JICA representative said that a Japanese expert would continue to support seaweed farmers in improving their methods and in the use of appropriate equipment. The government has indicated that it intends to close down existing marketing boards for sales of agricultural products. The Cashew Nut Marketing board has already been closed down. However, in the case of the Cotton Board, the Director General, who was initially removed on allegations of misappropriation of money, has been reinstated. Other marketing boards are being investigated to determine whether they are still carrying out the functions for which they were originally established. With funding from the Government of Venezuela, a ‘Partnership for Sustainable Rice Systems Development in Africa’ covering ten countries, including Tanzania, is being set up. It will begin by supporting efforts to improve domestic rice supply and strengthen the rice market. Permanent Secretary in the Tanzanian Ministry of Agriculture, Livestock and Fisheries, Dr Florens Turuka, said that rice productivity in Tanzania is lower than in most neighbouring countries and is one of the lowest in the world. He mentioned factors such as predominantly rain fed production, limited adoption and availability of improved cultivars, minimal use of fertiliser, traditional planting techniques and the limited areas of irrigation as being behind the low production. The new project will be implemented in five targeted irrigation schemes in Morogoro Region and will establish junior farmer field schools to upscale the adoption of systems of rice intensification, purchase of new processing machinery to reduce post-harvest losses. A new variety of alien weed affecting plant and human life is spreading around the Arusha region and causing considerable concern. Scientists from the Tropical Pesticide Research Institute (TPRI), Tanzania, the Wildlife Research Institute (TAWIRI) and Education Concerning Hunger Organisation (ECHO) are already studying the strange weed – “Parthenium” – which is referred to as ‘Gugu Karoti’ in Kiswahili. According to Ms Hannah Hacker, a researcher from Wheaton College in Illinois, the weed is found around Ngaramtoni, Kwa-Mrombo, parts of Meru and Njiro. She is working with ECHO, one of whose scientists is studying the problem, and has said that the first effect of getting into contact with the weed is developing skin rashes all over the body. Scientists warn that the weed could also grow in the Southern Highlands, Bukoba and some coastal regions should its seedlings find their way there. Scientists are at the moment conducting training to local residents in Arumeru and Arusha Urban districts on the dangers of the alien grass. When consumed by livestock, lesions in the mouth and excessive salivation occur. According to scientists, consumption also causes tainted meat and milk which can lower the value of livestock. A diet consisting of between 10% and 50% of Parthenium can cause death in cattle. Most livestock avoid Parthenium but will consume it if forced by circumstances to do so. Questions were raised in parliament about an apparent slowdown in Tanzania’s economic growth, particularly in some key sectors. Data from the National Bureau of Statistics showed a considerable decline in the rate of growth of the construction sector in particular, with growth having slowed to 4.3% in the first quarter of 2016 compared to 23.2% in the same period of 2015. Transport and manufacturing saw smaller declines in the same figures, from 14.5% to 7.9% and 9.9% to 7.4% respectively. “Some transport companies have reportedly cut their operations by up to 40%, while others have relocated to neighbouring countries because of uncertainty in the business environment in Tanzania. Is the government aware of this? What steps is it taking to address the situation?” asked Freeman Mbowe, Chadema party chair. Prime Minister Majaliwa replied there was no concrete evidence the economy has not been performing well. He told Parliament that for the government to come up with a definitive answer it would first conduct an in-depth study. He added that the government was already taking a number of measures to improve the situation at Dar es Salaam port, including seeking the advice of a number of countries that were operating successful ports. He further noted further that the decline in cargo was partly a global phenomenon linked to lower oil and gas prices in the world market. Bank of Tanzania governor, Prof Benno Ndulu, said there was no slowdown, but rather a re-distribution of money away from the pockets of corrupt people. “Nationally, there is enough money in circulation to serve and implement various public projects for the interests of all the people,” he stated, explaining that the government had plugged loopholes in illicit or cheap means of getting money, which was why those who had previously been taking advantage were now crying out for money. On executing the government expenditures for the first six months, the governor said there have been difficulties in obtaining foreign aid due to the world economic crunch, adding, however, that the cost cutting and tax collection measures helped to fund various projects. Meanwhile, the IMF issued a coded note of caution to the Tanzanian government to prevent national debt from growing out of control. “Careful prioritisation and implementation of expenditures will be required to ensure that spending does not exceed available resources and to avoid domestic arrears accumulation,” said IMF deputy managing director Min Zhu after the conclusion of the latest country review for Tanzania. “Creating fiscal space for higher infrastructure investment through sustained efforts to raise domestic revenue and increasing spending efficiency, particularly in public investment, is imperative,” Zhu added. The government plans to raise spending by 31% to TSh 29.53 trillion in its 2016/17 fiscal year budget, focusing on infrastructure and industrial projects. Suspension of operations at Dangote cement: a symptom of Magufuli’s economic dilemmas? The recent temporary suspension of production at the Dangote cement works in Mtwara, less than six months after the plant was opened, has been described as a sign of difficult times ahead for Tanzania’s economy. According to media coverage, promises made under the presidency of Jakaya Kikwete relating to tax exemptions and the supply of natural gas to power the plant have either been withdrawn or failed to materialise. “Before Kikwete left, the gas issue hadn’t been resolved but there were promises made that Dangote would get gas at a cheaper price,” a source familiar with the company’s business in Tanzania told Quartz, an online magazine. Dangote plugged the gap in their power supplies by importing coal from South Africa, until the Tanzanian government banned coal imports in response, arguing that domestic coal production should be supported. “We don’t want to hear that the price of imported coal from South Africa is cheaper than the price of coal from Mchuchuma to Mtwara,” said Medard Kalemani, Deputy Minister for Energy and Minerals. This forced Dangote to rely on generators which sent operational costs soaring. Operations at the plant were suspended in November. President Magufuli then became personally involved and reached a last-minute deal with Dangote in mid-December to keep the factory in the country and save thousands of jobs that were at risk if it closed. The president has taken a more hard-line approach to tax incentives than his predecessor, leading to concerns among some analysts and investors that Tanzania could lose out on future investment decisions as a result. The previous administration has been accused of giving Dangote Cement generous incentives through the Tanzania Investment Centre, including land for the factory and tax exemptions on importation of diesel and machinery. According to the East African, other potential investors in the cement industry are demanding similar incentives, which the government is finding hard to square with their commitment to reducing tax exemptions. The debate prompted by the Tanzanian government’s decision earlier in 2016 to withdraw from a proposed Economic Partnership Agreement (EPA) between the East African Community (EAC) and the European Union (EU) continues to rage. In September, the EU parliament extended Kenya’s current preferential access terms for an additional four months, to give Kenya time to persuade their Tanzanian counterparts of the benefits of the proposed agreement. Without the EPA, as a middle-income country, Kenya is set to lose their valuable trade terms with the EU – Kenya’s largest export market – worth an estimated $100m each month, and linked to around 4 million jobs. As a shared customs territory, all the six EAC members must sign the EPA for it to be implemented in the region. Tanzania has refused to sign, saying the agreement would have serious consequences for its revenues and the growth of its industries. Burundi has also declined to sign. Former Tanzanian President Benjamin Mkapa has previously personified the country’s resistance to the trade deal. In November, the Tanzanian parliament added their support for his arguments with a near unanimous vote to block the country from signing the EPA. Opposition MP, Zitto Kabwe, referred to figures from Eurostat and the International Trade Centre (ITC) to make the case that Tanzania would lose out heavily under the proposed deal. “Losses will mainly be caused by contractual demands requiring Tanzania to scrap tax barriers by 90 per cent on non-agricultural products from the EU and by 10 per cent on agricultural products. This means that Tanzania will remain a supplier of raw material and a market for value added products from the EU.” Kabwe added that Tanzania would lose anticipated revenue following removal of value added tax (VAT) payable as import duty to products from the EU. “We should build internal capacity first. World Trade Organisation conditions allow us access the EU market without taxation,” he concluded. Kenyan Vice President, William Ruto, said the agreement had given the EAC a lot of credibility and had assisted the region to attract investments He said backtracking on the agreement would erode the credibility the region has built over the last 20 years. “This will negatively affect prospective trade arrangements with other countries,” he said. Tanzania’s leading mobile phone networks were scrambling to meet a December 31st deadline for mandatory listing on the Dar es Salaam stock exchange (DSE). Vodacom, now under the name Vodacom Tanzania PLC, became in November the first network to submit its application for an Initial Public Offering (IPO). Tigo and Airtel, the second and third largest networks in the country are following close behind, though Tigo admit they are unlikely to meet the deadline. Under the Electronic and Postal Communication Act of 2010 (EPOCA) and the Finance Act of 2016, all telecoms companies in the country were required to list at least 25 per cent of their shares on the DSE before the end of 2016. It is expected that most such firms will complete the listing requirements in the first quarter of 2017. Financial experts described the listing of the foreign-backed mobile phone giants on the local stock exchange as a ‘game changer’ in the country’s capital market. “When a telecom company lists on a stock exchange, its impact is significant. Our nearest example is Safaricom in Kenya, where its listing on the Nairobi Stock Exchange changed the dynamics of NSE to date,” said Moremi Marwa, chief executive officer of the DSE to The Guardian. “The impact on the DSE will result in almost the doubling of its market capitalisation, which is good and it will of course offer more choices to investors,” said George Fumbuka, chief executive officer of CORE Securities Limited. “The parent companies of these telecommunications companies are abroad, so when they make profits all the profit goes out of the country,” said a spokesman of the Capital Markets and Securities Authority.